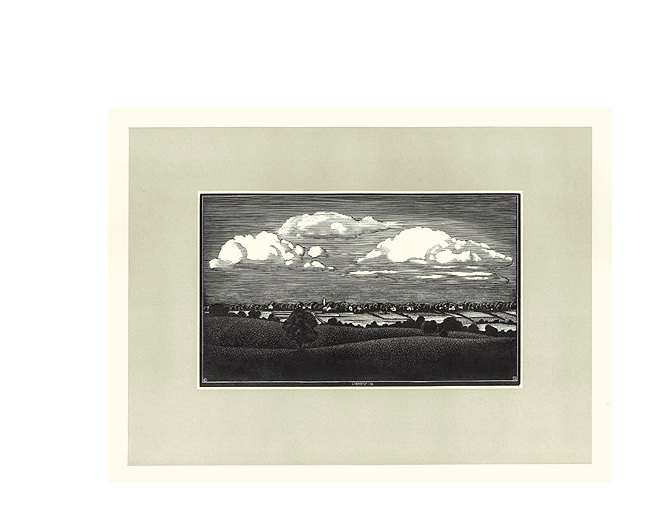 Clouds Over the Valley - -1935, Wood Engraving. Springfield 51. Edition not stated. Signed and dated in the block, bottom center. Image size 7 7/8 x 10 7/8 inches (200 x 276 mm); sheet size 13 x 18 inches (330 x 457 mm). 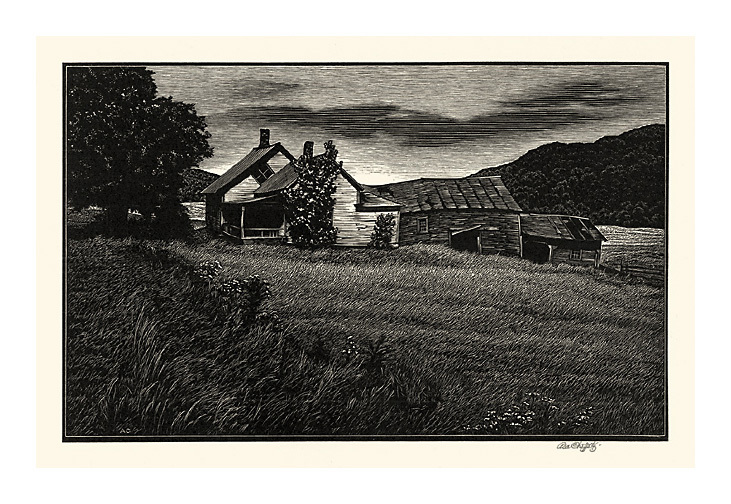 A fine, black impression, on cream wove paper, with full margins (1 7/8 to 3 1/2 inches). Minor rippling in the top sheet edge; original tape stains in the top left and right sheet corners; a small (1/8 inch) loss in the bottom right sheet corner; all well away from the image; otherwise in excellent condition. With the original AAG folder mat; the mat with a clean hole punch in each of the four mat corners. 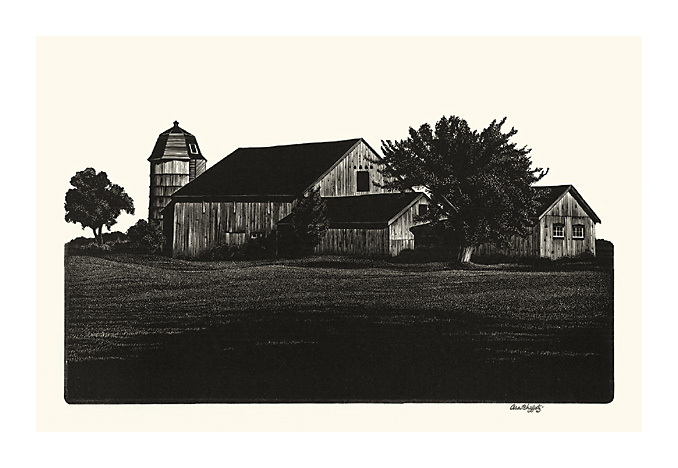 Deserted Farm - -1941, Wood Engraving. Springfield 91. Edition 250. Signed in pencil. Initialed in the block, lower left. Image size 5 1/2 x 8 15/16 inches (140 x 227 mm); sheet size 10 1/2 x 13 inches (267 x 330 mm). A brilliant, black impression, on cream wove paper, with full margins (2 to 2 7/8 inches), in excellent condition. In the original AAA mat with their label attached. Distant Haze - -1942, Wood Engraving. Springfield 60. Edition 250. Signed and titled in pencil. Initialed in the block, lower left. Image size 4 5/8 x 8 3/16 inches (154 x 252 mm); sheet size 8 3/16 x 10 3/8 inches (184 x 244 mm). A brilliant, black impression, on off-white wove paper, with full margins (1 1/8 to 2 inches). A repaired tear across the top right sheet corner, well away from the image, otherwise in excellent condition. 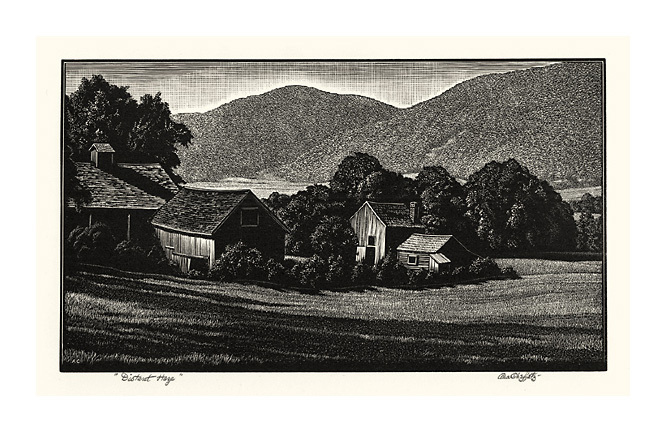 May Sunlight - -c.1950, Wood Engraving. Springfield 61. Edition 250. Signed in pencil. Initialed in the block, lower left. Image size 6 1/16 x 9 15/16 inches (154 x 252 mm); sheet size 9 9/16 x 12 9/16 inches (184 x 244 mm). A brilliant, black impression, on off-white wove paper, with full margins (1 to 2 inches), slight light stain from mat window; in excellent condition.